OXON HILL, Md.–A manufacturing platform that reduces the amount of capital, materials, and energy needed to build vehicles, and a wireless electric vehicle charging system that enables batteries to be charged while driving were among the technologies awarded special recognition at the 2016 R&D 100 Awards, announced in November by R&D magazine. In selecting what are judged to be the "100 most technologically significant products introduced into the marketplace over the past year," the international awards competition recognizes excellence across a wide range of industries, including telecommunications, optics, materials science, and biotechnology. Divergent 3D, a Los Angeles-based startup with a radical new approach to automotive manufacturing, took top honors in the Special Recognition: Green Tech category, receiving the Gold Award for its environmentally efficient Divergent Manufacturing PlatformTM. Meanwhile, Toyota Engineering and Manufacturing North America, headquartered in Erlanger, Kentucky, received the Bronze Award in the Special Recognition: Green Tech category for the Wireless Power Transfer Based Electric and Plug-in Vehicle Charging System. Toyota co-developed the technology with a team of researchers from Oak Ridge National Laboratory (ORNL) and support from Cisco Systems and the International Transportation Innovation Center. 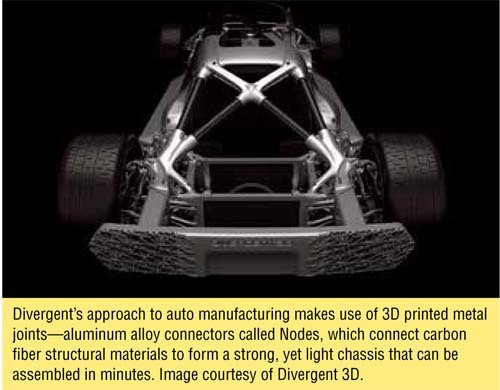 Divergent 3D is attempting to greatly reduce the materials and energy used to manufacture vehicles, along with the associated costs and pollution, through a software-hardware platform known as the Divergent Manufacturing Platform. The platform is said to enable people to design and build a strong, very light chassis for vehicles ranging from a two-seat sports car to a pickup truck. Its key building blocks are 3D-printed metal NodeTM connectors, aluminum-alloy joints that connect pieces of aerospace-grade carbon fiber tubing to form the chassis. The Nodes reduce the amount of time, material, and actual 3D printing required to build the chassis, making it much lighter and far less costly and energy-intensive than those used on traditional vehicles. And instead of making expensive changes to hard tooling, manufacturers can use the software to rapidly iterate the hardware design. Divergent 3D is hoping that small entrepreneurial teams will use its manufacturing platform to build their own cars at microfactories, which are intended to make innovation affordable while reducing the health and environmental impacts of traditional manufacturing. The Wireless Power Transfer (WPT) Based Electric and Plug-In Vehicle Charging System is described as a "paradigm shift in plug-in and electric vehicle charging," which, through its radio communication sub-system, offers "an autonomous, safe, and convenient option to conductive charging and its attendant need for cables." In addition to eliminating the hazards of tripping over cables, the non-contacting system is said to eliminate issues with leakage currents, ground faults, and touch potentials. Reported by ORNL to be the world's first 20-kilowatt wireless charging system for passenger cars, the system can be used for stationary charging and for dynamic charging, which allows electric vehicle (EV), plug-in EV, and hybrid batteries to be charged during driving. The WPT system's 20-kilowatt power level is said to be three to five times higher than existing charging systems can achieve, enabling faster and dynamic charging. Higher power levels are also necessary for powering larger vehicles, such as trucks and buses. According to ORNL, the team developing the system achieved 90 percent charging efficiency at three times the rate of the plug-in systems commonly used for EVs today. The ability to combine that speed with the convenience of wireless charging could help increase the acceptance of EVs by consumers, and is considered a key enable for hands-free, autonomous vehicles. The high-power wireless system relies on a unique architecture that includes an ORNL-built inverter, isolation transformer, vehicle-side electronics, and coupling technologies.